Luna Shamsuddoha is a software entrepreneur and Chairman, Dohatec New Media, Bangladesh, since 1992. It provides Software solutions in Bangladesh and abroad. Clients include World Bank, World Health Organization and Government of Bangladesh. She led her team to develop the Voter Registration Software with Biometric Face and Finger Matching in record time, putting an end to uncertainty and political deadlock in 2007. Deduplication involved 80 million voters. Fair and credible elections were held with accurate Voters List in December 2008. Microsoft presented Luna at Worldwide Partners Conference in Denver in 2007 for her achievements. Dohatec has developed several e-Governance projects. It developed the first Public Procurement MIS, implementing key indicators emanating from OECD-DAC Paris Declaration to bring transparency, accountability and efficiency in government procurement. The solution receives international attention. Dohatec as nominated sub consultant developed Electronic Government Procurement e-GP System; a World Bank Project Dohatec developed the MIS for Employment Generation Program for the Poorest (EGPP), a Safety Net Project funded by the World Bank for Government of Bangladesh. Dohatec is a Certifying Authority and issues Digital Certificates and commenced its operation from 2012 including identification certificates and SSL Certificates. It has PKI enablement solutions as well. Luna is the Vice Chair of Independent University Bangladesh Trust, a past Director of state owned Agrani Bank and Member, Executive Committee, Bangladesh Employers Federation. She is a Governor of Underprivileged Children's Educational Program (UCEP), an NGO with 50,000 distressed urban working children receiving marketable skills and employment service. Luna is the Founder and President of Bangladesh Women in Technology, Forum to empower women through Technology; encourage girls to study and pursue technology careers. She is a member of the Board of SME Foundation, Government of Bangladesh. She is a Trustee, Scholarship for Talents Advancement Resources & Services. Her endowment offers scholarships and supports cultural activities. 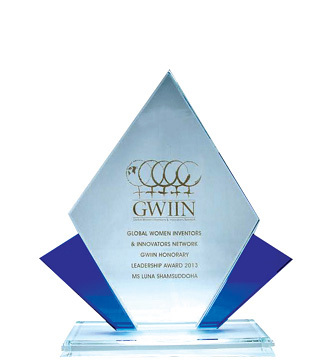 She received Honorary Leadership Award 2013 Global Women Inventors & Innovators Network (GWIIN) in Stockholm, Sweden in November 2013 during 4th Bi-annual International of EUWIIN. She is a Member, Brains Trust – Strengthening the Global Trade Regime, International Chamber of Commerce, IMD and Evian Group. Luna received the Annanya 2013 (Ittefaque) Best 10 Award in the technology entrepreneur's category She secured Masters in International Relations and began teaching English at the British Council, and Lecturer, Institute of Modern Languages, Dhaka University.